The so-called Photo app is the main picture viewer on the OmniaPRO. It's got all its bases covered - convenient one finger zooming, browsing by date, slideshow with plenty of options and eye candy. Selecting an image loads it in a single view where you can zoom or slide to the next one. There are dedicated on-screen buttons for zooming, which toggle on and off automatically. Double tap zooming is also available although, unlike the Omnia II, the B7610 OmniaPRO zooms in on the center of the image rather than the spot where you tapped. Samsung have also implemented the one-finger zooming we came to know since the S8000 Jet. You just need to hold it on the screen for a second and then drag up or down for zooming in or out. This method works in both galleries (as well as the web browser) and it is at the very least as convenient as the pinching gesture on the iPhone. Tilting the phone to its side or opening the QWERTY keyboard escapes the mundane grid arrangement. It displays your photos in a 3D arc and they slightly overlap each other. You then scroll them with a sweeping finger gesture. There is also a second arc of thumbnails crossing the current one - and it holds the folders. So with a single move you can scroll either the images within a folder or the whole list of folders. An alternative landscape view is available, which displays a 5 x 4 grid of photos with a timeline slider underneath. You can scroll horizontally by swiping sideways (this method works with kinetic scrolling) or you can use the time slider to select a particular month. It's all pretty smooth and generally one of the nicest gallery apps as far as user-experience is concerned. Samsung's attempt to create a superior photo browsing app that sports 3D graphics and an innovative interface is really commendable. And so is their general effort to give WinMo the total interface makeover that it needing for quite some time. Samsung have wisely decided to give WinMo users a new touch-friendly media player and spare them the inconvenience of installing a third-party one to substitute for the poor default WMPlayer. The one that comes on the B7610 OmniaPRO is identical to what we already saw on the Omnia II we previewed not so long ago. It handles both video and audio files, supports playlists and has the standard album/artist/tracks sections. DNSe and SRS technologies are available in just a coupe of clicks and can really enhance the headphones sonic experience. There are two main views available in the B7610 OmniaPRO player. The first one is the Library - at the top you have six tabs: all music, albums, artists, genres, videos plus Now Playing. When you switch into play mode, you see a simple and clean interface. It has the standard music buttons you would expect - volume, skip, play/pause and shuffle, while the album art fills most of the screen above them. The options menu offers the ability to play the music faster/slower or to set the track as a ringtone. Playing video is very simple - it's done the same way as an audio file. The player interface looks the same, but tapping twice turns on the fullscreen mode. It has the same control buttons as the standard one, but everything is intended for landscape orientation and there is no taskbar at the top or empty black spaces. Tilting the OmniaPRO to the side switches to a cover-flow-like view. For audio albums, it displays the album art and offers an alphabet scroll at the bottom for quick searching. For videos, it displays a video frame instead of album art and lacks the alphabet scroll. As the OmniaPRO has full DivX and XviD video support, it successfully managed to playback all test videos we trew at it - up to VGA resolution and 2Mbps bitrate, that is. With DLNA and TV-out functionality, this is quite the pocketable movie player. We made out traditional Core Player benchmarks with the Samsung B7610 OmniaPRO along and compared them with the HTC HD2 and the Acer neoTouch. Surprisingly, the OmniaPRO performed very poorly, well bellow what the Snapdragon duo. Check out the results below. As you might have guessed, videos looked excellent on the high resolution AMOLED display, though the inability to handle high bitrate videos is a point against it. The FM radio on the Samsung B7610 OmniaPRO has a really neat and simple interface and can automatically scan and save the available stations in your area. The radio also has RDS support and automatic scanning for an alternative frequency. This means that if you travel during reception, the OmniaPRO should take care of auto-switching to the regional frequencies of your selected radio station. There is room for only six shortcuts to your favorite stations on the radio app screen. Saved stations appear as notches in the landscape version of the UI. In that mode, you can swipe sideways to change the frequency and there's kinetic scrolling available to make things faster. The only complain we have is that you have to manually slide it to the notches of saved stations, it won't snap automatically. That can be a pain at times. The audio quality of Samsung B7610 OmniaPRO is great - there are no major weak spots whatsoever. The handset did excellently in most parts of our test, achieving some pretty impersive scores. 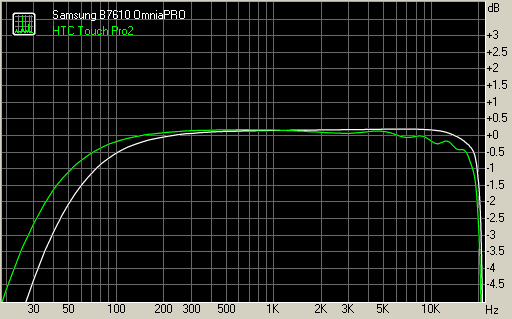 The cut-off in the extreme low bass frequencies (seen on the graph) are our only grudge about the OmniaPRO audio output. In the rest of the range however the handset fares very well, with the largest deviation being only 0.19dB. The THD, noise level, dynamic range and stereo crosstalk readings are nothing short of excellent and the intermodulation distortion is among the better in the class. Here go the results so you can compare it to some of the other handsets we have tested.